PIN - SARAH COVENTRY. CARNIVAL DANCER OR EXOTIC DANCER. 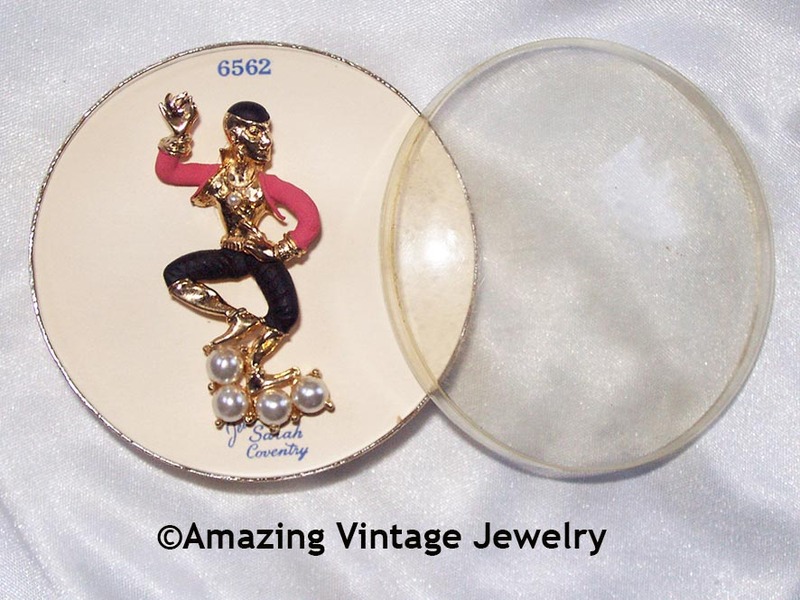 GORGEOUS, EXTREMELY HARD-TO-FIND ITEM FEATURES GOLDTONE AND BLACK AND PINK/RED ENAMEL, ACCENTED BY FAUX PEARLS. IN EXCELLENT CONDITION - STILL IN THE ORIGINAL CLEAR DOMED BOX, ON THE ORIGINAL CARD. VERY RARE!!! SHOWN IN "IDENTIFYING SARAH COVENTRY JEWELRY 1949-2009" BY SANDRA STURDIVANT AND SHIRLEY CRABTREE - PAGE 10.